We are very proud to expand our Facial Services to our guests. For years I have always been passionate about skin care and slow down the aging process. I have used and trying many different products in the past 20 years that delivered result and maintain the youthful appearances. And now, I want to share my love for skin care with all my guests. Our Signature facial will leave your skin feeling fresh and invigorated. Perfect for the person looking to enhance their complexion and more radiant skin. This purifying treatment removes dead skin with the application of a DMK gentle peel exfoliation, which perfectly preps the skin for complexion detoxification. A long facial massage will relax your tired muscle, which is followed by a Hydrating mask to purify and brighten your skin. Say good bye to dull skin. The result is more noticeably beautiful and hydrated skin. Our Signature Deluxe facial makes natural beauty easy to achieve that instantly plump, hydrate, and brighten the skin. The facial starts with a thorough cleansing of the skin and exfoliation with Micro Scrubber, which sloughs off the dull layers of skin, removing acne blemishes, while simultaneously improving skin tone and texture. The treatment is followed by skin detoxification to enhance your natural beauty complexion and long facial massages to relax your tired muscle. The treatment ends with a Enzyme mask correcting your skin PH balance. Your face will feel refreshed and restored. Best results are achieved by a series of 3-6 treatments spaced a week apart for more cumulative results. Treat yourself to our Microdermabrasion facial. 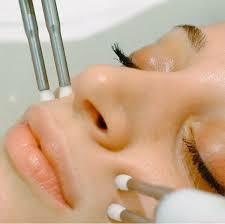 This facial focuses on deeply exfoliating and removing dead skin with microdermabrasion treatment. This procedure results in an even skin tone complexion, healthy glow, and smooth beautiful skin. The treatment is finished with a custom mask (selected based on your skin type) and moisturizer. Please allow a few days for best results. Don’t let your face have all the fun! The back treatment provides a complete cleansing for those hard-to-reach spots and purifies the back by brightening exfoliation and extractions if necessary leaving your back smooth, soft, and a more even skin tone.. This perfect combination of cleansing and exfoliation treatment will improve your skin in just one application. Choose from Vitamin C, AHA or BHA chemical peel to naturally lift dull skin, speed up cellular turnover to brighten, tighten, and lighten your skin. Good for all skin types and perfect just before an event for beautiful skin! The Bio face lift technology uses micro currents to stimulate cells and re-educate muscles. Bio lifting tones muscles, softens wrinkles and rejuvenates the skin. Ultrasonic facial works on a deeper level of the skin compared to many other traditional facial techniques. The ultrasonic facial is gentle, non-invasive suitable for most skin types, from acne to rosacea and sun-damaged skin. The ultrasonic machine’s high-frequency waves work to exfoliate dead skin cells for clear and radiant skin; gently stimulates skin to encourage collagen and elastin production; facilitates hydration and plumps the skin. Your skin will glow, making it the perfect treatment to indulge in before a big event. Once your skin is rejuvenated and healthy looking, maintain your results with monthly ultrasonic facials. With a series of treatments, fine lines and wrinkles are less noticeable and skin color, tone and texture becomes more even and uniform.